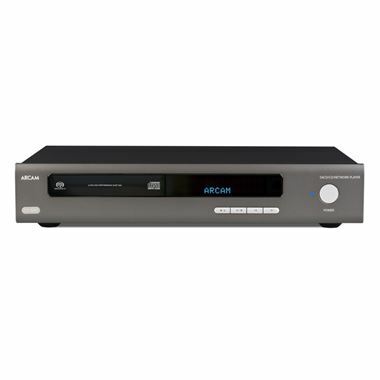 Arcam HDA Series CDS50 SACD/CD player with Network Streaming. Available with Online Finance and Free Delivery. The Arcam CDS50 disc player has single-ended and balanced outputs and also comes with a brand new learning backlit infra-red handset. The product can be controlled over IP and can be controlled by ARCAM’s IOS app, Musiclife or by RS232 control. The CDS50 also has 2x DAC inputs, 1x optical and 1x SPDIF plus UPnP and CIFS streaming up to 24-bit/192kHz for even greater flexibility! Streaming control through the Arcam music life app. In a sense, digital audio doesn’t exist. You’d have to be a particularly dull superhero to possess ears that can decode the millions of 1s and 0s that make up your CD collection or iTunes library. Whatever the source – be it a laptop, CD player, smartphone, USB stick – the result is just a vibration in your speakers. In other words, it all winds up analogue in the end. Arguably, when playing from a digital format, the most vital component is the DAC, or Digital to Analogue Converter. We’ll spare you the bulk of the science, but this is what translates that otherwise lifeless binary code into audible sound energy. Bit-depth, meanwhile, is a key measure of audio quality. So, if you’re listening to a 24-bit WAV copy of your favourite album through an amp that only converts to 16-bit, there’s a good chunk of detail going to waste right there. That’s why we’ve included 32-bit DACs on the entire HDA range – the most commonly used bit-depth in digital recording – so you’re guaranteed the full aural picture of whatever the artist intended.